What is the Voiceless Speak Fund? Since 1987, the Voiceless Speak Fund has empowered Guatemalans with personal knowledge of human rights violations to stand up for themselves and their communities. The Fund provides direct assistance to Guatemalans interested in educating the public in the US about the human rights situation in Guatemala or organizing in their communities in the US to defend the rights of Guatemalans living here. ¿Que es el Fondo Voiceless Speak? Desde 1987, el Fondo Voiceless Speak ha empoderado a guatemalteco/as con conocimiento personal de violaciones de derechos humanos a defender a su mismos o a sus comunidades. El Fondo brinda asistencia directa a guatemaltecos/as quienes están interesados en educar a la publica estadounidense acerca de la situación de los derechos humanos in Guatemala o organizar en sus comunidades en EEUU para defender los derechos de guatemaltecos/as viviendo aquí. Eva Morales is a Guatemalan refugee living in the United States after fleeing the political violence in her home country that killed her father and two brothers. Eva has worked with various human rights organizations within her adopted country to protest the military regime, support the peace process, and denounce US military aid to Guatemala. Morales is the co-founder of Global Youth Connect, and founder and chair of the Familia Morales fund. In 2013, her family finally located her father’s remains with a DNA test conducted by the Fundacion de Antropologia Forense de Guatemala. Her project involves the creation of a photo-video narrative to tell her family’s struggle to find disappeared persons and their success in finally finding her father’s remains. Upon completion of the video, she proposes to organize a special viewing for her fellow Guatemalans living in the United States. This meeting will give her the opportunity to encourage others to pursue DNA testing in order to find their own loved ones, and to also build support for efforts to improve the human rights situation in Guatemala. Mendoza grew up in a Mayan community in San Mateo Ixtatan, Huehuetenango, in the 80s and 90s. During the war, his father supported the Indigenous rights movement, working as a schoolteacher to educate children in their native Indigenous language, Chuj. 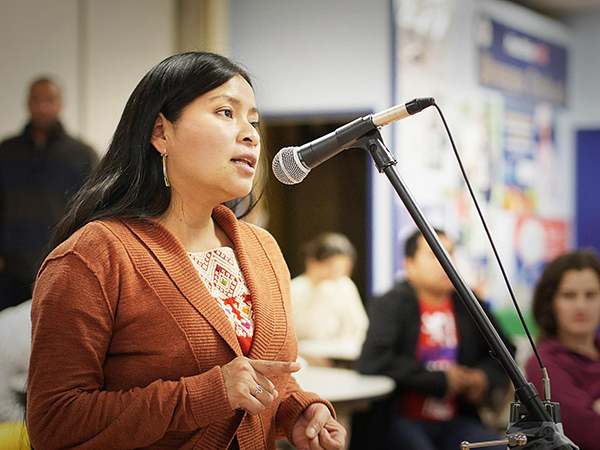 Mendoza now lives in the United States, and works on providing bilingual education to immigrant children, many of whose families are undocumented and came to the United States from Mexico and Central America, fleeing violence and poverty. Despite the common heritage of many of his students, many of their teachers don’t understand their cultural backgrounds and the historical context that they come from. He proposes to organize community activities and gatherings that raise awareness around the Guatemalan genocide. These activities include screening powerful documentaries to educate the community, hosting activists as guest speakers, art sessions, and activist’s events. Through community organizing and education, he seeks to share the conditions in which Latin American immigrants live, the background history of violence in Guatemala, and its connections to US foreign policy. Catarina has worked in various different capacities to support human rights in Guatemala. This has been done through education, and by supporting small organizations that promote the rights of women and Indigenous peoples. Currently she works with the Parlamento Maya, a group that supports the rights of Mayans, and that fights against the wrongful incarceration of activists (criminalization). She also serves on the Board of Ingles en Accion to support the empowerment of the immigrant community. Her proposal is to support the community radio station of Santa Eulalia that was closed down by the local mayor. Her mission is to create three radio stations in the US that would broadcast via the internet, in both Spanish and the Indigenous language Q’anjob’al. In doing so, Catarina hopes to raise awareness and share information about the Q’anjob’al community to those in the US, and to tell others about their struggle for human rights in Guatemala. Ambrocio has worked as a community activist for many years, fighting against discrimination, the harmful effects of transnational corporations, and in the promotion and protection Indigenous peoples’ and women’s rights. Most recently, he has supported the immigrant community in New York, New Jersey and Connecticut, and educates them about the injustices that continue to plague their home country. He proposes to continue airing a community radio show that talks about issues that affect Indigenous communities in Guatemala, and host experts and activists to share their perspectives. His work will support and inform not only Guatemalans but also those in other countries wishing to support Guatemalans in their struggle. Batz is a researcher working on his dissertation about resistance movements against megaprojects such as hydroelectric dams and mine construction. He also works with organizations to support the protection of natural resources and Indigenous education. His proposed project would organize workshops to highlight certain human rights issues in Guatemala, with a particular emphasis on the problems surrounding megaprojects. He also hopes to address the disconnect between the children of Guatemalan immigrants and the history of their parents’ home country that he is witness to as a second generation immigrant. Juarez was born and raised in Los Angeles, California, to an Indigenous Guatemalan immigrant family. Growing up, her parents refrained from teaching her their native Indigenous language to protect her from the discrimination that Indigenous peoples in their home country faced. Nevertheless, today she struggles to communicate with her grandparents, and regrets her inability to communicate in the native language of her ancestors. In order to promote her language as a human right, and its connection to the Q’anjob’al culture, her project proposes the creation of a language education program. This program will provide an opportunity for Guatemalan and Mayan children, youth, and adults to learn a Mayan language. This knowledge will serve to reconnect them with their cultural heritage and remember the history of their home country.